Emotions Dance performed at the Fringe outdoor stage. I waited at The Daily City tent until they arrived. I finally saw a dancer stretching her legs using the temporary containment fencing as a ballet barre. Larissa Humiston, the dance companies founder gave the dancers a quick pep talk, and then it was time for the show. Larissa explained to the audience that the first dance piece was about a failed relationship. Amanda Miller and Courtney Coad were the dancers. As always the modern dance was beautifully choreographed and full of emotion. I sketched Cortney when she turned her back to her partner and Amanda lay prostrate in desolation. 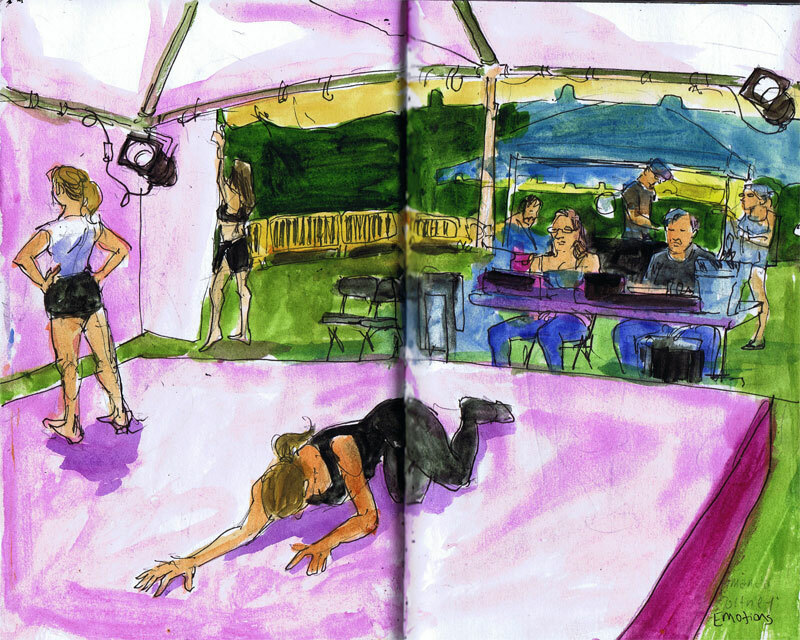 I ended up sketching Amanda a second time as she stood gripping a curtain prior to another dance routine. As I was finishing up my sketch, Amanda Miller and Jovan Davis asked to see what I was working on. Jovan seemed to be a real fan of my work. He bubbled with excitement. Terry joined in and said jokingly to the couple, "Back away from the artist." She steered the conversation for a few minutes till I considered the sketch done. Amanda then explained to me that she became over heated during one of the dance routines. By now Larissa had joined the conversation and she said to Amanda, "Yea, I saw that look on your face." Even with a few dry heaves, the show went on. No one in the audience, including myself, had any idea. The Emotions Dancers always perform "all out". Larissa has begun to organize dance workshops with world renowned dancers at Turning Point dance studios. This dance company continues to astound me. Hey, cool! I have always wanted to be in one of these!